Choosing Wisely Canada just released 61 new recommendations compiled from 12 specialty organizations that are now available in DynaMed. These recommendations are intended to help clinicians and patients avoid unnecessary tests and treatments, and to help them make smart and effective choices to ensure high-quality care. "Unnecessary tests, treatments and procedures do not add value to care. In fact, they take away from care by potentially exposing patients to harm, leading to more testing to investigate false positives and contributing to stress for patients. And of course unnecessary tests, treatments and procedures put increased strain on the resources of our health care system." Choosing Wisely Canada is modeled after the Choosing Wisely campaign in the United States, an initiative of the ABIM Foundation. The Canadian campaign has been developed in partnership with the Canadian Medical Association and involves more than 30 specialty societies. The recommendations are not meant to be used to establish coverage decisions or exclusions but to spur conversations about what is appropriate and necessary treatment. 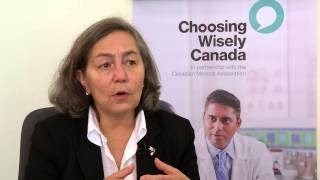 All of these recommendations can be found in the Choosing Wisely Canada topic in DynaMed and the DynaMed editorial team is working with the Canadian Medical Association and related organizations to integrate the recommendations across the relevant clinical topics in a way that maximizes their visibility in the flow of patient care where they are most needed. Click here for more information and to read the official press release.